A Little Book about Confession review and giveaway | House Unseen. Life Unscripted. It's been a few weeks since I got Kendra's book A Little Book about Confession for Children in the mail. And finally! Here I am! Not shirking in my duties! Chances are you've already read a review of this handy little book, but....well, you should read another one. Because I gots stuff to say! First, I'd like to suggest, as Jessica did, that this is not a book "for kids" that you just hand to them with a quick prayer and a smile. 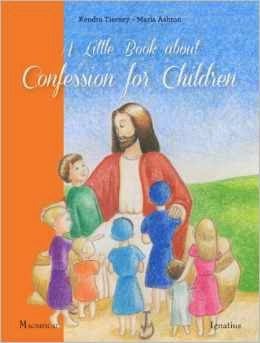 It's a book about children going to confession, but I really feel it is an excellent way for parent and child to discuss, understand, and appreciate the sacrament together. - It's physically small. But not too small. It's a book, not a pamphlet, but a book that won't overwhelm either parent or child. -The front inner flap thingy (can you tell I know all the proper publishing terminology? Be impressed.) has a handy dandy step by step list of what actually happens when you go to confession with the act of contrition written out at the bottom. It's like a cheat sheet without, like, actually cheating on anything. Because wouldn't THAT be ironic. -The back inner flap thingy has a bullet pointed examination of conscience that's appropriate for kids, as opposed to a lot of the ones you commonly find that stuff that really only adults ought to be worrying about. -Within the book, all the commandments are broken down and described in a way that's similarly geared toward children. Rather than saying "this commandment doesn't apply to you yet" it's "this is HOW this commandment might apply to you right now." -There are a few saints who have a special connection with the sacrament of reconciliation and they're featured in a special way in this book. My kids and I really enjoyed reading about their lives and how their intercession or inspiration might help us reap the full benefits of going to confession. Okay! So clearly you want and need this book, right? Well, you can win one of your very own (I'll send you the one that Mary hasn't scribbled in yet. You're welcome.) by leaving a comment right here on this post that you'd like to be entered. Super easy, right? Normally I would make a Rafflecopter form and give you a thousand chances to enter to win, but Cecilia is wasting away on the sofa behind me (read: she has a cold and is a drama queen) and this here laptop is about to run out of batteries. I'm a good planner, as you can tell. Et voila! Leave of a comment of any sort, but if you want to be ENTERED TO WIN you have to ask to be entered. Otherwise you won't be entered. Because what if you already have the book and you just want to leave a comment about how much you love it, know what I'm sayin'? Enter thru Friday afternoon at 5 p.m. and I'll post the winner in my 7 Quick Takes at 'round 8 p.m. or so. I would love to be entered! I'm a 2nd grade catechist and this would be a great resource! Thanks! I would love to be entered! Such a great resource for our family! Enter me! I've had my eye on this book and would love to win. Oh, enter me please! I've been reading lots of good things about this book and would love to have this resource on hand for my kiddos. Please enter me in the drawing! Please! My son starts 1st grade in the fall, and I'm kind of hyperventilating over sacramental prep. So please! Please enter me. Felicity will begin preparation for her First Confession in the Fall and it would be a lovely addition to our preparations. :) Thx. Could you please enter me in the drawing? I think this would be a fantastic book to add to our shelf! I would love to be entered! Thanks. I'm momentarily delurking (or is it unlurking? I haven't done it often enough to know) to ask: Please enter me! I have read several reviews of this book and it sounds like the perfect thing to help me prep my kids. :) Plus I also lurk on Kendra's blog. Would love to be entered! Thanks! I want to be entered. Thanks! Please enter me- would love a copy! Yes, please. I hope Cecilia feels better ASAP. please enter me. Sounds like a fantastic book from all the reviews. Enter me please! I've heard so many good things, I'm convinced! Please enter me too! I will have a 2nd grader in the fall. Enter me, please! This would be perfect for one of my boys!! Please enter me so that I can give it to John Paul in a couple of years! Because if I give it to him now, he will devour it and know all the stuff in it and then demand that he be allowed to have his first penance so that he can have his first communion. At age 4.5. Which I don't think is a good idea. Consider me entered! Thanks for the opportunity! I'd love to be entered to win! First year teacher of third graders and they've had the sacrament, but still need a lot of information and this sounds perfect! What a great little book! Please enter my name for the book giveaway.....would love to have it.....sounds like a great resource! Please may I be entered to win this contest? I've never won a contest before, and I have two young boys, AND I like what you write. AND I like what you recommend. Please enter my name in the giveaway - thanks! Yes please I would like to be entered!! Please enter me to win! Thank you! Enter me please! There's a 2nd grader at my house! Please enter me! This sounds like an excellent resource for first reconciliation! Don't enter me, I already won it from Jessica. But I just have to say, I love your review! I haven't read the whole thing yet, but I do love it and I love the same things that you pointed out. You are awesome! I have a First Communion boy jumping for joy to receive Jesus in May. He would love this book. Please enter me! Thanks! I'd like to be entered. Sounds like a great book to add to our library. I'd like to be entered, I'd love to put this in my son's Easter basket! I would like to be entered, please! Thank you! Please enter me. I would love to win this for my great nephew. Never too early to get them started! I would love to be entered. Thanks!! It has been a WONDERFUL addition to our Catholic library! Thank you Kendra Tierney for this incredible resource! I purchased this book a little while ago. I have read through it slowly just to savor the concepts, ideas, and creativity. I appreciated the front and back "dust jacket" - mini flaps on the inside front and back cover of this lovely small softcover book. Very creative. I learned a few things myself, think it will be a fine way to teach my daughter so much as she gets ready for her first Confession and First Holy Communion next year.